I don’t think there is one person that is not busy (and I mean extremely busy) this time of year. Between shopping (I haven’t even BEGUN) and parties and events; not to mention traveling; this time of year can be stressful (even though you are trying to have fun). One website I have found to be rather helpful this Holiday season along with their yummy products has been the Pillsbury website and products. Their website has useful Holiday tips and recipes (and great tips and recipes year round). In case you haven’t figured it out yet Pillsbury has sponsored today’s give away. They are giving ONE lucky Kitchen Concoctions reader a prize pack with 2 coupons for Pillsbury Crescent Creations and holiday severing platters. 1. Click on the links below and check out some appetizers made with Pillsbury Crescent Rolls and Pillsbury Crescent Creations. Then come back here and leave a comment on which one of the three recipes below you want me to re-make with my own twist. Your vote will enter you to win the prize pack and the recipe with the overall most votes will be the one I remake with my on personal twist. Contest ends at 9 p.m. CST on Sunday, December 20, 2009. With winners announced sometime Monday, December 21, 2009. I will post the ‘winning recipe make-over’ sometime Tuesday, December 22, 2009. This giveaway is sponsored by Pillsbury and My Blog Spark. Also, don’t forget to enter in yesterday’s Fiber One Giveaway. I am going to leave you today with a recipe. This recipe actually ties in with the Pillsbury giveaway. 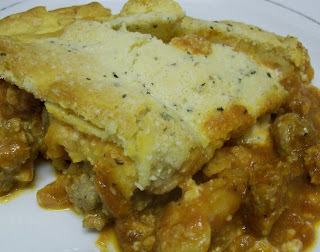 I originally found this recipe over on The Girl Who Ate Everything Blog. It was the actual winner of the 1978 Pillsbury Bake-Off. This casserole uses the crescent rolls for the crust (so it ties in perfectly with the giveaway). This is a very fast, hearty, and tasty meal- perfect for this time of year! Heat oven to 375°F. In large skillet, cook ground beef, onion, 1 teaspoon Italian seasoning and salt and pepper over medium heat for 8 to 10 minutes or until beef is thoroughly cooked, stirring frequently. Drain. Stir in pasta sauce; cook until thoroughly heated. Meanwhile, in medium bowl, combine mozzarella cheese, 1/3 cup Parmesan cheese, and sour cream; mix well. 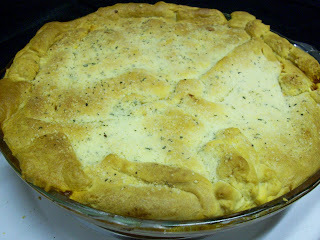 Pour hot beef mixture into ungreased 9 1/2 or 10-inch glass deep-dish pie pan or 11×7-inch (2-quart) glass baking dish. Spoon cheese mixture over beef mixture. Unroll dough over cheese mixture. In small bowl, mix Parmesan cheese, 1/2 teaspoon Italian Seasoning and butter. Spread evenly over dough.Bake at 375°F. for 18 to 25 minutes or until deep golden brown. I would like to see the Bacon Cheese Tartlets as vegetarian with good flavor of something that replaces the bacon. For some reason, my comments never save on your sight…I think some is trying to sabotage my winning! I want to make the Christmas tree. I agree with Stacy…I would like to see the Christmas tree. I think the Christmas tree is cute, but I personally would want to eat the bacona nd cheese tartlets!